Directions (1-5): Study the given information carefully and answer the following questions. In a certain Number system the numbers were represented in symbols @ and $. Now answer the questions given below. 1. Find the product of $$@@ and $@$@? Which of the following is square of a Number? 3. What is the sum of $@$@$@$, $$$$$@@ and @@@$$$? From only option C we get 216. 4. In which of the following we get 28 as answer? 5. When $$@$$@@$@ is divided by @$@$@@$ what will be the remainder? Directions (6-10): Study the given information carefully and answer the following questions. 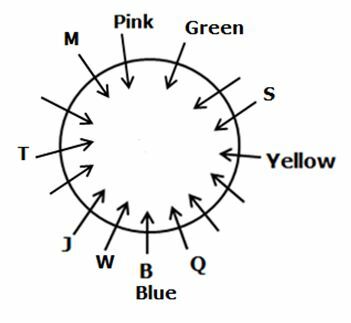 Certain numbers of people are sitting in a Circular table facing towards the Center. Only few of their names and seating positions are known. B and Q are immediate neighbors. Two people sit between Q and J (Either from left or right of Q). J sits sixth to the left of the one who like Yellow. 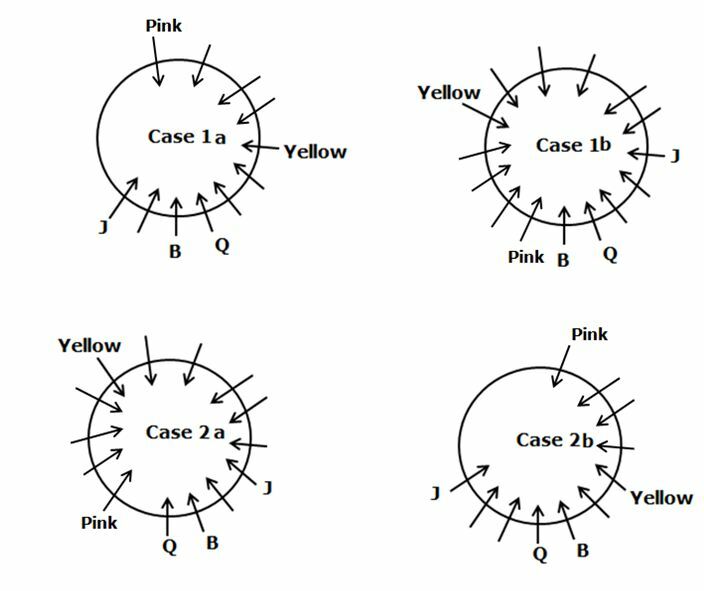 The one who like Pink sits fourth to the right of the one who like Yellow. M sits immediate right of the one who like Pink. Four people sit between M and W who sits exactly between B and J. S sits sixth to the right of W.
The one who like green sits second to the right of S.
Not more than sixteen persons seated in a circle. The one who like Blue sits fourth to the right of T.
No one is an immediate neighbor of T (adjacent seats are vacant). Not more than sixteen persons seated in a circle. From this statement case 2a is eliminated because of more than sixteen people. 7. Who sits third to the right of the one who like Pink color? 8. What is the position of the one who like Blue with respect to S? 9. 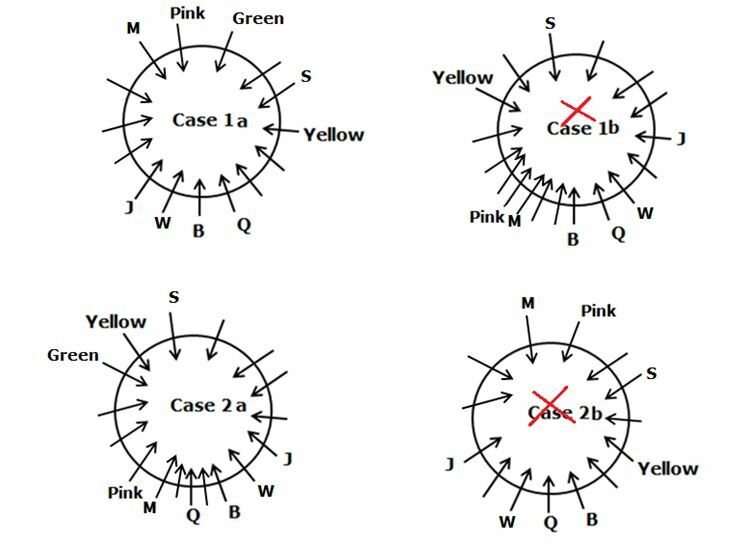 Number of person sits between M and Q when counted from the left of M is same as Number of person sits between the one who like pink and ______ when counted from right of the one who like Pink color? 10. 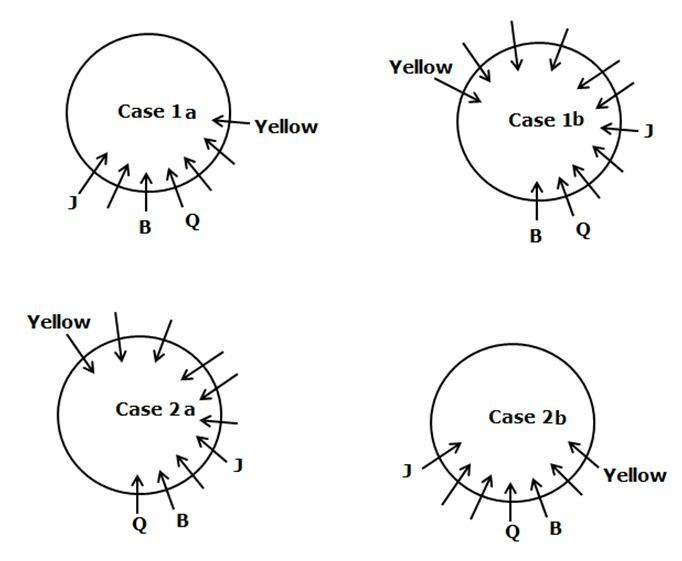 How many seats are present in the circular table? 1) Find the product of $$@@ and $@$@? 2) Which of the following is square of a Number? 3) What is the sum of $@$@$@$, $$$$$@@ and @@@$$$? 4) In which of the following we get 28 as answer? 5) When $$@$$@@$@ is divided by @$@$@@$ what will be the remainder? 6) Which of the following statement is true? 7) Who sits third to the right of the one who like Pink color? 8) What is the position of the one who like Blue with respect to S? 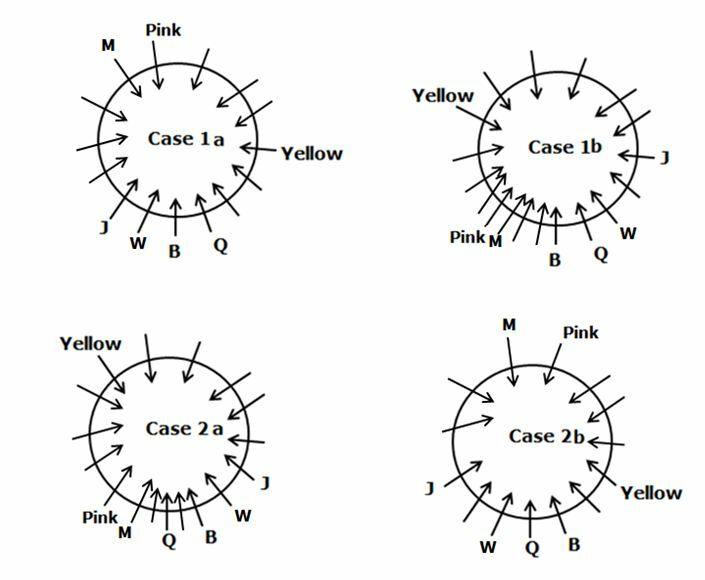 9) Number of person sits between M and Q when counted from the left of M is same as Number of person sits between the one who like pink and ______ when counted from right of the one who like Pink color? 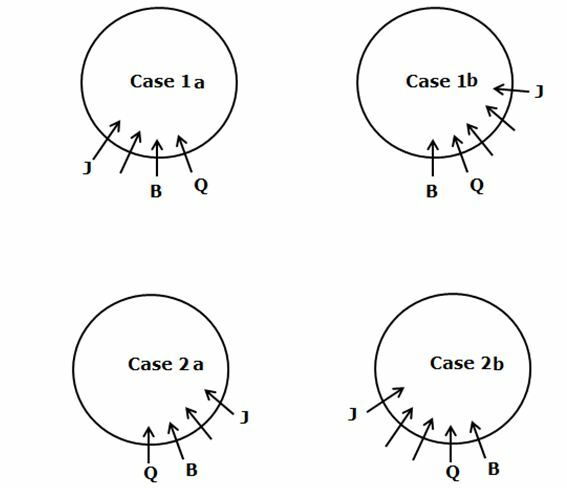 10) How many seats are present in the circular table?